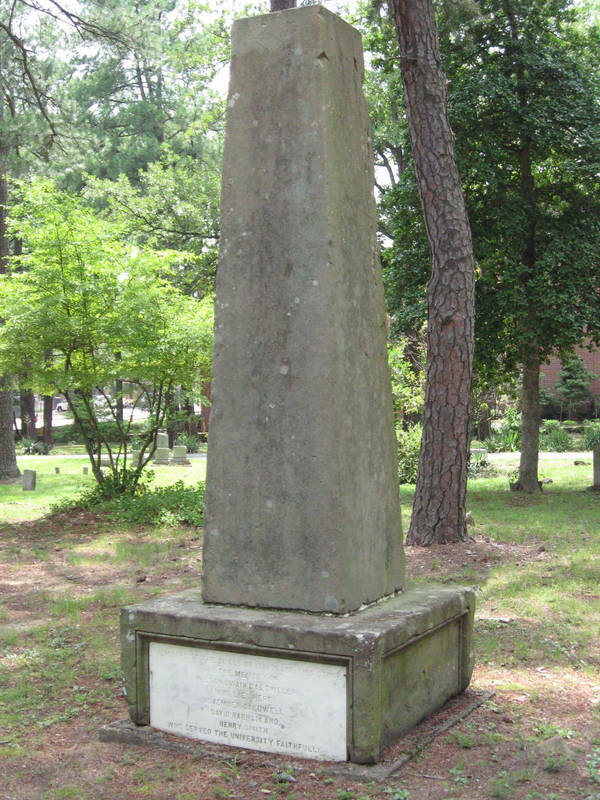 This sandstone obelisk, completed in 1837, was the first monument built for UNC president Joseph Caldwell. In 1904, when the current monument in McCorkle Place was erected, the Class of 1891 placed this monument on Wilson Caldwell's grave in the Old Chapel Hill Cemetery and rededicated it to three other slaves who worked for the University. It stands in the section reserved for African Americans in honor of Wilson Caldwell (whom university president David Swain owned), his father November Caldwell (whom Joseph Caldwell owned), and two other men, all longtime servants of the university. Thomas A. Waitt, the designer and builder, also finished Gerrard Hall on campus after William Nichols left the building unfinished.